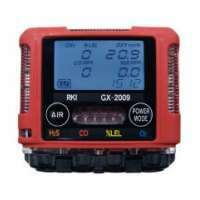 RKI Instruments Distributor: Manufacturer Trained Supplier of RKI Instruments Safety Products. RKI produces a complete line of gas monitoring equipment for utilities, mining, police, fire, rescue, hazmat, shipping, transportation, telecom, refineries, offshore drilling platforms, petrochemical plants, parking garages, wastewater treatment, pharmaceuticals, manufacturing, HVAC, laboratories and more. RKI is also known for unique product development of fixed gas detecting systems using audible alarms, visual warning lights, capable of operating in the harshest environment, with flame arrestors and coatings which make them water repellent. Also, splash guards are available for use in very wet environments. RKI's personal protection equipment (PPE) is designed to meet unique gas detection needs while maintaining worker safety.